Through stringent selection of ingredients, our R&D team has produced a unique formulation of instant coffee which has been marketed for 10 years in South East Asia. The ingredients used are natural and no chemical additives such as fragrance, coloring, preservative and maltodextrin are added. We use Arabica and Robusta Coffee Powder which are produced by the State-of-the-Art Manufacturing Facilities – spray drying with minimal temperature to preserve the very good of coffee aromatic compounds. We drink coffee to energize the body in order to feel better and perform better. However, we realized that almost all instant coffee in the market is acidic. It has become a health concern. 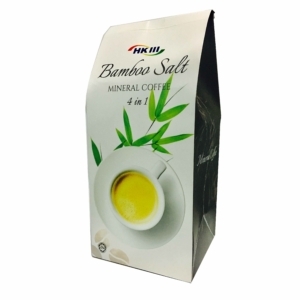 With our prestigious active ingredients Korea Bamboo Salt added, the acidity of coffee is neutralized and hence we bring you the best tasting healthy coffee. Remarks: The Bamboo Salt plant is ISO certified and the manufacturing process is patented.